We’ve been wanting to make a blackberry gin for some time. Our previous summer was notoriously wet, but this summer has had heat and dryness which has produced the blackberries that we’ve been hoping for. These weren’t big luscious, juicy fruit but were very intense and packed with flavour. We sourced wild blackberries from the Uriti Valley and these had the sort of feisty flavour you’d never find in supermarket berries. 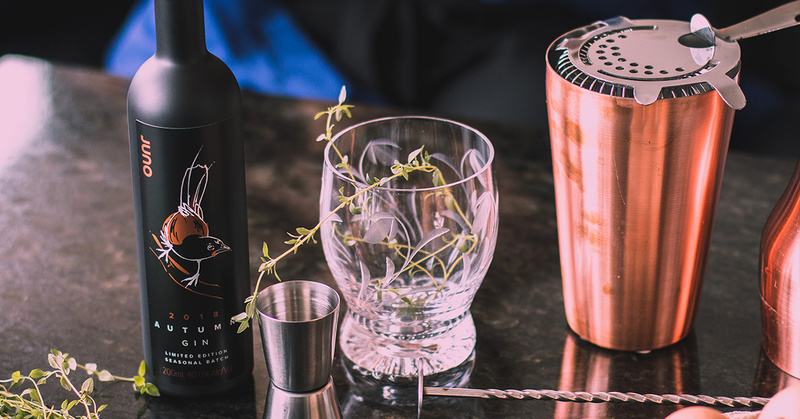 When it came to pairing flavours in the still, and in order to pick up on the wildness from the blackberries, we added thyme to increase that savoury flavour. Then we used black current to add to that sensation of lush fruit. When you first taste the gin, it has this heat and you say “Oh, that’s a gin”, but then it settles down to these beautiful berry notes. The blackberries proved to be an intriguing technical challenge in the distillation process because of the high water content in the berries (even in the dry berries we sourced). So we needed to extract that water out before could extract the flavour notes. The end result is a delicious gin that we love paired with apple juice and soda. There’s a real sense of home and warmth in the gin. The New Zealand native bird on the label is a saddleback (tieke) who are very noisy in the bush and just sort of stomp around. It made us remember blackberrying as kids, stomping around in big gum boots over thorny bushes.